S. Nambi Narayanan (12 December 1941) is an Indian scientist and aerospace engineer and Padma Bhushan award winner. As a senior official at the Indian Space Research Organisation (ISRO), he was in-charge of the cryogenics division. In 1994, he was falsely charged with espionage and arrested. The charges against him were dismissed by the Central Bureau of Investigation (CBI) in 1996, and the Supreme Court of India declared him not guilty in 1998. In 2018, the Supreme Court through the bench of Dipak Misra awarded Narayanan a compensation of ₹50 lakh, to be recovered from the government of Kerala within eight weeks, and the apex court also constituted a committee headed by retired Supreme Court judge D. K. Jain to inquire into the role of officials of the Kerala police in the arrest of Narayanan. He was awarded India's third highest civilian award the Padma Bhushan in 2019. 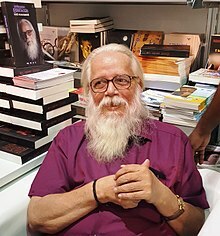 S. Nambi Narayanan was born on December 12, 1941 to Tamil parents in Nagercoil , in present-day Kanyakumari District of Tamilnadu, where he also completed his schooling. His family traces its roots to Eruvadi village in Tirunelveli District of Tamilnadu. Narayanan first met Vikram Sarabhai, the then Chairman of ISRO, in 1966 at the Thumba Equatorial Rocket Launching Station in Thumba, Thiruvananthapuram, while he worked as a payload integrator there. Also chairman of the Space Science and technology Centre (SSTC) at the time, Sarabhai only recruited highly qualified professionals. In pursuit, Narayanan enrolled at the College of Engineering in Thiruvananthapuram for his MTech degree. Upon learning this, Sarabhai offered him leave for higher education if he made it to any of the Ivy League universities. Subsequently, Narayanan earned a NASA fellowship and entered the Princeton University in 1969. He completed his master's program there in chemical rocket propulsion under professor Luigi Crocco in a record ten months. Despite being offered a job in the US, Narayanan returned to India with expertise in liquid propulsion at a time when Indian rocketry was still solely dependent on solid propellants. Narayanan introduced the liquid fuel rocket technology in India in the early 1970s, when A. P. J. Abdul Kalam's team was working on solid motors. He foresaw the need for liquid fuelled engines for ISRO's future civilian space programmes, and received encouragement from the then ISRO chairman Satish Dhawan, and his successor U. R. Rao. Narayanan developed liquid propellant motors, first building a successful 600 kilograms (1,300 lb) thrust engine in the mid-1970s and thereafter moving on to bigger engines. In 1992, India signed an agreement with Russia for transfer of technology to develop cryogenic fuel-based engines and procurement of two such engines for ₹235 crore. However, it did not materialize after the US president George H. W. Bush wrote to Russia, raising objections against the transfer of technology and even threatening to blacklist the country from the select-five club. Russia, under Boris Yeltsin, succumbed to the pressure and denied the technology to India. To bypass this monopoly, India signed a new agreement with Russia to fabricate four cryogenic engines, alongside two mockups for a total of US$9 million, after floating a global tender without a formal transfer of technology. ISRO had already reached a consensus with Kerala Hitech Industries Limited which would have provided the cheapest tender for fabricating engines. But this did fail to materialize as the spy scandal surfaced in late 1994. After working for nearly two decades, with French assistance, Narayanan's team developed the Vikas engine used by several ISRO rockets including the Polar Satellite Launch Vehicle (PSLV) that took Chandrayaan-1 to the moon in 2008. The Vikas engine is used in the second stage of PSLV and as the second and the four strap-on stages of Geosynchronous Satellite Launch Vehicle (GSLV). In 1994, Narayanan was charged with leaking vital defence secrets to two alleged Maldivian intelligence officers, Mariam Rasheeda and Fauzia Hassan. Defense officials said the secrets pertained to highly confidential "flight test data" from experiments with rocket and satellite launches. Narayanan was among two scientists (the other being D. Sasikumaran) that were accused of selling the secrets for millions. However, his house seemed nothing out of the ordinary and did not show signs of the corrupt gains he was accused of. Narayanan was arrested and spent 48 days in jail. He says that the Intelligence Bureau (IB) officials who interrogated him wanted him to make false accusations against the top brass of ISRO. He alleges that two IB officials had asked him to implicate A. E. Muthunayagam, his boss and then Director of the Liquid Propulsion Systems Centre (LPSC). When he refused to comply, he was tortured until he collapsed and was hospitalised. He says his main complaint against ISRO is that it did not support him. Krishnaswamy Kasturirangan, who was ISRO chairman at the time stated that ISRO could not interfere in a legal matter. In May 1996, the charges were dismissed as phony by the CBI. They were also dismissed by the Supreme Court in April 1998. In September 1999, the National Human Rights Commission (NHRC) passed strictures against the government of Kerala for having damaged Narayanan's distinguished career in space research along with the physical and mental torture to which he and his family were subjected. After the dismissal of charges against them, the two scientists, Sasikumar and Narayanan were transferred out of Thiruvananthapuram and were given desk jobs. In 2001, the NHRC ordered the government of Kerala to pay him a compensation of ₹1 crore. He retired in 2001. The Kerala High Court ordered a compensation amount of Rs 10 lakhs to be paid to Nambi Narayanan based on an appeal from NHRC India in September 2012. On 3 October 2012, The Hindu reported that Kerala government had dropped charges against the police officials who were alleged to have falsely implicated Narayanan in the espionage case on the grounds that over 15 years had passed since the case was initiated. The top officer involved in the case, Siby Mathews was later appointed Chief Information Commissioner in Kerala (2011 - 2016). It was reported on 8 November 2012 that Kerala government had not complied to the Kerala High Court order to pay compensation Rs 10 lakhs. On 7 November 2013, Narayanan was made media discussion that he is seeking justice in this case and want to expose who were behind this conspiracy and said that this case will 'discourage' the youth. On 14 September 2018, the Supreme Court appointed a three-member panel headed by its former judge to probe the "harrowing" arrest and alleged torture of former space scientist Nambi Narayanan in the 'ISRO spy scandal' that turned out to be fake. A three-judge Bench led by Chief Justice Dipak Misra also awarded Mr. Narayanan Rs. 50 lakh in compensation for the "mental cruelty" he suffered all these years. The reprieve comes almost a quarter of century after Mr. Narayanan, a top scientist in the ISRO before his arrest and detention, began his legal battles in various forums for his honour and justice. Finally, this scientist got justice from government of India when he got the third-highest civilian award in the country - the Padma Bhushan in the field of Science & Engineering-Space. In October 2018, a biographical film titled Rocketry: The Nambi Effect written and co-directed by R. Madhavan was announced. The teaser of the film was released on 31 October 2018 and the film is scheduled to release in mid-2019. On Jan 26th 2019, he was conferred the Padma Bhushan award by the Government of India. His autobiography titled Ormakalude Bhramanapatham (ഓർമകളുടെ ഭ്രമണപഥം) was released on 23 October 2017. The book deals with the ISRO espionage case in which Nambi Narayanan, along with five others, were subjected to repeated third degree and sustained interrogation by the Kerala Police and Intelligence Bureau in the early 1990s. The other suspects in the case included ISRO scientist D. Sasikumaran, Russian space agency official K. Chandrasekhar, and ISRO’s contractor S.K. Sharma and two Maldivian women. ^ a b Narayanan, Nambi; Ram, Arun (2018). Ready To Fire: How India and I Survived the ISRO Spy Case. Bloomsbury Publishing. ISBN 9789386826275. Retrieved 31 October 2018. ^ "A false case that delayed India's cryogenic project". Main.omanobserver.om. Archived from the original on 4 October 2012. Retrieved 4 October 2012. ^ "'Rocketry – The Nambi Effect' teaser: Madhavan presents scientist Nambi Narayanan's story". ^ Rautray, Samanwaya (9 May 2018). "Supreme Court to restore ISRO scientist's lost reputation". The Economic Times. ^ "Padma awards for 2019 announced: Full list of awardees". The News Minute. 25 January 2019. Retrieved 25 January 2019. ^ "18/11/2018) Rajapattai". Thanthi TV. ^ Ittyipe, Minu (13 July 2017). "A Gladiator In The Space-Ring". Outlook. Retrieved 31 October 2018. ^ Mehta, Nikita (10 March 2014). "How Isro got an indigenous cryogenic engine". Livemint. Retrieved 1 November 2018. ^ "The Scientist Who Wasn't A Spy". The Times of India. Retrieved 2012-10-04. ^ "Unsung hero of moon mission is sad but forgiving". Thaindian.com. Retrieved 2012-10-04. ^ "What happens to the four years of life they have been robbed of?". Rediff.com. Retrieved 2012-10-04. ^ Sarin, Ritu (3 January 1999). "Wrongly accused ISRO scientist seeks damages". The Indian Express. Archived from the original on 28 September 2004. Retrieved 31 October 2018. ^ "'Cops Tortured Me'". Outlookindia.com. Retrieved 2012-10-04. ^ A shattered man now sits cool and detached. The Hindu, 8 September 2012. ^ "Kerala drops charges against police officials in ISRO espionage case". Thehindu.com. Retrieved 2012-10-04. ^ "I was the one who was victimised in ISRO espionage case: Former Kerala DGP Siby Mathews". Thenewsminute.com. Retrieved 2017-06-07. ^ "ISRO spy case victim wants justice". daijiworld.com. 7 November 2013. ^ "Prosecute persons behind the ISRO case: Nambi Narayanan". The Week. 8 November 2013. ^ "ISRO spy case victim wants justice". thehindu.com. 14 September 2018. ^ "R. Madhavan: 95 per cent of Indians don't know about Nambi Narayanan, which I think is a crime". ^ "Teaser of R Madhavan's 'Rocketry – The Nambi Effect' gets 10 million views in 24 hours!". Most detail of false ISRO Spy case.